A sauce has the power to transform the simplest grilled seafood or chicken into an event. 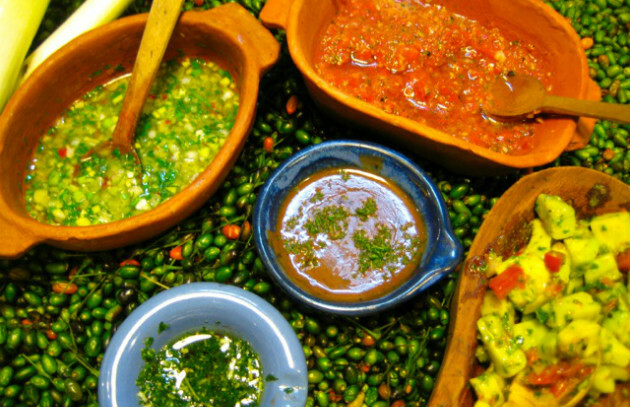 You now know about regional American barbecue sauces and the sauces of South America. Today, we look at some of the best grilling condiments you may have never heard of: the barbecue sauces of Europe. Romesco (Spain): This gutsy red puree of roasted tomatoes, garlic, onions, olive oil, and fresh and dried chiles thickened with bread and ground nuts may be the most famous sauce in Catalonia. Smoke-scented and earthy, romesco pairs well with all manner of grilled seafood, poultry, and meat. But the sauce’s highest purpose is as a dip for calçots, Catalan spring onions (they resemble large scallions or small leeks) charred over grapevine fires and served in bunches on terra cotta roofing tiles. In Spain, romesco is traditionally made with smoky dried ñora chiles—the same chiles used to make Spanish paprika. You can buy the chiles online (and for a limited time, Oregon-grown calçots as well) from La Tienda. You can substitute dried ancho or pasilla chiles, which taste similar and are more readily available. No surprise here, but I always char the vegetables and toast the bread and nuts on the grill before making the sauce. Curry Sauce (Germany): Perhaps you have read “The Invention of Curried Sausage” (Die Entdeckung der Currywurst) by Uwe Timm, a novella that skyrocketed to the top of Germany’s best-seller list in 1993 and was made into a movie in 2008. No? Well, maybe you have visited the Deutsches Currywurst Museum in Berlin. No? If you’re not familiar with it, currywurst—thin slices of sausage doused with curried spiced tomato sauce—is the country’s most popular street food. Germans eat an estimated 800 million servings of currywurst per year. You’ll have to read the book (or Planet Barbecue!) to get the full story—suffice it to say that the sauce was born of an accident involving a container of curry powder and a case of ketchup. Strange as it sounds, the combination of ketchup and curry makes an amazing sauce for grilled sausages and other grilled meats. Rouille (France): This garlicky rust-colored sauce (that’s what rouille means in French) originated as an accompaniment for bouillabaisse. Why should fish stew get all the love? Any sauce that starts as fire-roasted red bell peppers, contains prodigious doses of garlic and cayenne pepper, and comes so generously perfumed with saffron that you can smell it across the room grabs my attention, and I can assure you, from first hand experience, it works wonders on grilled lamb, veal, vegetables, and of course on grilled fish and shellfish. Rouille (pronounced roo-EE) is easy to make in the food processor, or you can go the traditional route and pound the ingredients together in a mortar and pestle. It’s also excellent as a spread for bruschetta or sandwiches.